How many times have you watched a home show and saw designers and home owners go gaga over wood floors? Wood has long been a coveted material for floors. It’s easy to care for, adds warmth and character. Wood is a traditional must for floors and more recently wide plank wood has replaced bead board and wainscoting as the go to architectural detail for walls and ceilings. Wood can be stained any color with any finish making it a perfect choice for a modern rustic look. The use of the same whited washed wide plank wood on the floors and walls offers a minimalist feel with a ton of texture and pattern and a monochromatic color scheme. 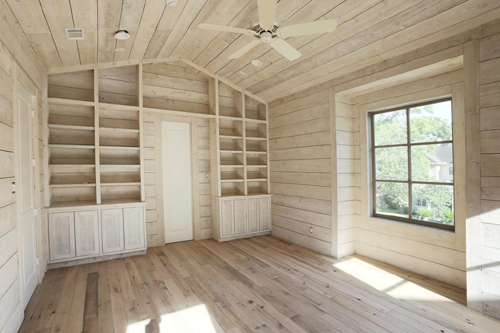 Imagine this room filled in with modern furniture pieces featuring straight lines, and exposed wood legs. Accessorize the book shelves with a few nautical pieces or mix and match vintage milk glass pieces. It’s a fresh look with a lot of possibilities. The wood ceiling in the kitchen and carried through to the dining room ties the two together. It’s another unexpected touch that works. Most people opt to leave their ceilings textured with plaster and left white. It’s less risky, but when it comes to design, risks are worth taking. This is one risk that was well executed. This is by far my favorite use of wide plank wood flooring gracing the walls of a room. 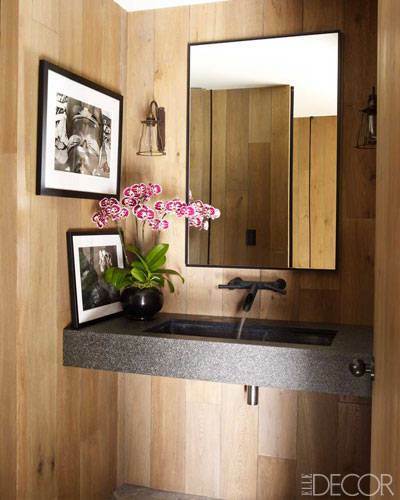 In this case it’s Courtney Cox’s bathroom in her completely renovated barn turned amazing home. As a former architect student Courtney had a say in every step of the design process. She opted to install wide plank wood on the bathroom walls. This look is a stylish alternative to the expected tile or wallpaper on the walls. If you would like this look, it can be achieved with Carlisle Wide Plank Floors, using their White Oak with a Veiled White Stain and a Clear Matte.